Trey Xavier of Gear Gods contacted us about contributing some Mooer micro pedals for a “shoot-out” style review he was doing to build his “dream” fly rig pedalboard. We jumped at the opportunity and sent Trey a Baby Tuner, a Funky Monkey, a Hustle Drive, a Noise Killer, a Repeater, and a Tres Cab for the shoot out. This week is the first installment of his shoot out. First up are the wah pedals. At the time of the review, we didn’t have a Wahter pedal so we sent Trey a Funky Monkey Autowah to use against the mini wah pedals from Dunlop, Morley, and Hotone. Even though the Funky Monkey does not have a rocker pedal it still compares well. Trey really likes the compact size, quality of sound, and options of the Funky Monkey. If you don’t use a wah that often the Funky Monkey saves quite a bit of space over even the smallest of the wah pedals and may be your best option. Check out the video for the full test results and check back next week for the next installment. The Mooer FireFly M6 : A Pedal Board that Fits in your Glove Compartment! Osiamo Music Group and Mooer Audio are excited to announce the update to the popular Firefly pedal board. The Firefly – already the world’s smallest pedal board – now holds 6 Mooer pedals firmly and securely in place. It’s a small ergonomic gem. The Firefly features 6 form fitting slots, a heavy duty polymer shell to withstand the abuse of being stepped on for many years, a removable lid and a DC cable with 6 ends to power all your pedals with one power supply. Did we mention it can fit inside your glove box? Image a pedal board with 6 true bypass micro pedals that weighs less than 6 lbs! Small enough to fit in a backpack; easy to carry from house to car to stage. Go straight to the gate on your fly dates. No need to check the Firefly at the airport just carry-on with you. And don’t forget, Mooer now has 54 models available with more to come! Imagine the sound and tonal possibilities. Kool Fact 2 : Say 6 is not enough, then chain 2 M6 boards together for 12 pedals! affordable, all Mooer pedals less than $98! Not to name drop but a certain Guitar God from the most Iconic 80’s Pop/Rock band just picked up a loaded Mooer M6 for a Brazilian “fly date.” Stay tuned for a complete review! Well 1000 words ain’t worth one video review so check out the informative video from Neal! He does a short demonstration of just one of the many possibilities available to you with Mooer micro pedals. His pedal choices: Repeater, Mod Factory, Soul Shiver, Solo, Funky Monkey and Sweeper. In all, 16 effects plus overdrive in a board that weighs less than 6 lbs! Comment on this post with your 6 choices for a Firefly M6 would be and Neal will use his favorite suggestions in his next Firefly demo. Let us help you find your tone and sound with Mooer pedals. From Racer X to his new project The Order of Control, Bruce Bouillet has accomplished lots with his excellent guitar playing. Now Bruce has joined the Micro pedal revolution. He’s added 5 Mooer pedals to his pedal arsenal: Pitch Box, Mod Factory, Funky Monkey, Lofi Machine, and Micro Power. Here’s a picture of his Mooer setup. Read more about Bruce and what he’s been up to here. Learn more about Mooer pedals here. 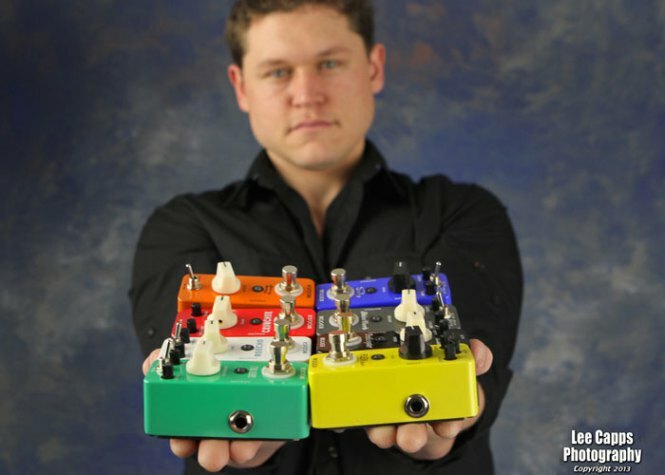 As a grande finale to the “30 Pedals in 30 Days 2012,” The Tone King reviewed a mini-board of our Mooer micro pedals. You can check out the video here on YouTube or at The Tone King. Louis gives 5 of our newest pedals a comprehensive review including the Funky Monkey, the Rage Machine, the Repeater, the Acoustikar and the Lofi Machine. Next he gives us some nice combos so we can hear what the pedals sound like together in combination. If you haven’t check out The Tone King you should. It’s a really informative site with many in-depth and comprehensive reviews.